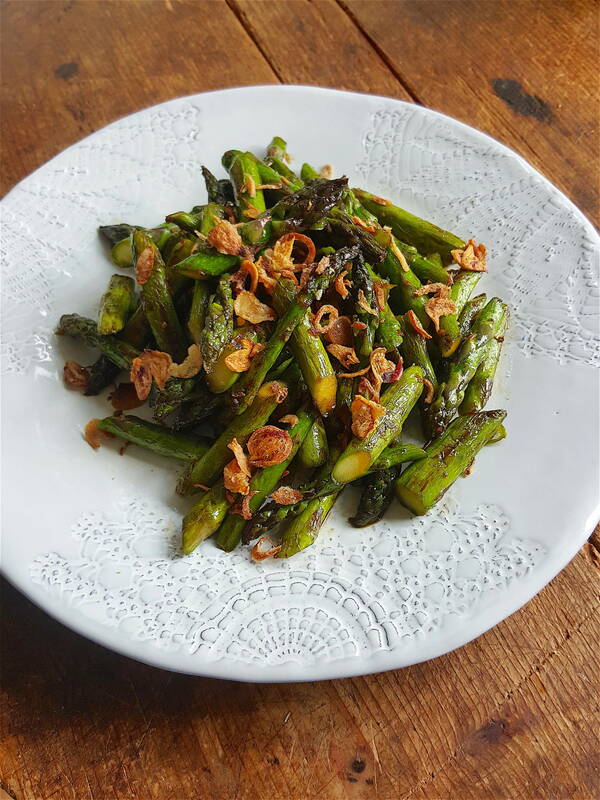 Asparagus with Crispy Shallots Once asparagus is cheap add some heat! This is the treatment for asparagus once it’s as cheap as chips – mid to late season. Trim asparagus and cut into short lengths. Heat a wok (or a heavy-based frying pan/skillet) over a medium-high heat, and add the oil. Get the oil nice and hot, then add the asparagus. Stir-fry for 3-4 minutes, until lightly browned and starting to soften a little. Add the water – be prepared for it to steam up ­– and cook until it evaporates. Add the garlic and cook for 1 minute, stirring often, then add the chilli and ginger and cook through briefly. Stir in kecap manis and transfer to a serving bowl. Sprinkle the top with crispy shallots and serve. Kecap manis (also known as ketjap manis) is an Indonesian thick and sweet soy sauce, made from soya beans, palm sugar and spices, including star anise. Available from Asian food stores. Refrigerate after opening. Thanks California for helping us out over winter ... but we don't need you now. Oh, oops, though would you mind sending us your pomegranates for our festive tables? Ta.